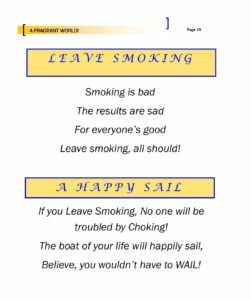 Here are some thoughts on how non-smoking and other healthy lifestyle tweaks can help in Success and manifestions of our dreams! Non-Smoking and Success! YouTube Channel for ‘A Fragrant World’! Last few days ago Cape Breton University, Sydney, Canada took steps to lessen the tobacco culture in the university! Well done CBU! Very happy to share our website and facebook page with MADD (Mothers against Drunk Drivers) at their Maritime Bus Station St. John, New Brunswick, Canada outreach box. We hope to get their esteemed attention to our initiative. They are an awesome group promoting such!